The names of Russian political parties rarely reflect their ideology – but that really doesn’t matter. Similar phenomena can be seen across Russia’s political spectrum. The Communist Party is actively engaged in business and supports the Russian Orthodox Church. The Right Cause party is the party of the educated middle class and focuses on social welfare issues. One of the peculiarities of the Russian political system is that the agenda of the parties rarely reflects their names and often the party is not identified with its name or its agenda, but rather with a colorful leader. The United Russia party, which is de facto headed by Prime Minister Vladimir Putin, claims to be centrist. In everyday political usage, it is referred to as the “party of power.” This title reflects something completely different from “the ruling party,” which is the party that wins elections. In the Russian context, the party has power not because it wins the elections – the party wins the elections because it has power. And the word “power” should be taken literally here: Russia’s entire ruling elite belongs to United Russia. Seventy of the country’s 85 Governors are members of the party, as are the State Duma speaker, both deputy speakers, and large number of ministers, and key government officials. Experts say that, in fact, United Russia is a party without a program. Rather, it adapts its ideology to whatever policy is being pursued by the authorities. During the Duma election campaign four years ago, Russian parties rarely appealed to voters directly, preferring instead to publish their programs in the media, and ideological issues were not at the forefront of public debates. But the parties’ leadership may just have been respecting the wishes of voters. “Party ideologies began to fade under Yeltsin. This is not the fault of the current government, but rather a feature of post-Soviet Russia, which, unlike the former Soviet republics, has not found its ideological core,” said Nikolai Petrov, political analyst at the Carnegie Moscow Center. The past 10 years has seen a tightening of the political field in Russia. The number of players has decreased, and those who have stayed have learned to be more obedient. “This, firstly, is because real politics is concentrated in the hands of United Russia, which does not tolerate competition and, secondly, it is because there was no public demand for an independent party. Instead, the public mentality demanded strong figures, party leaders, and this is why they became even easier to control,” said Alexei Mukhin, head of the Center for Political Information. Legislative barriers to the creation of political parties, meanwhile, have grown ever higher; the threshold for entrance into the Duma has been raised to 7 percent of the vote, and the procedures for registering parties for elections has been complicated further. The minimum turnout threshold has been abolished, as have the direct election of governors, mayors of federal cities and members of the upper house of parliament. 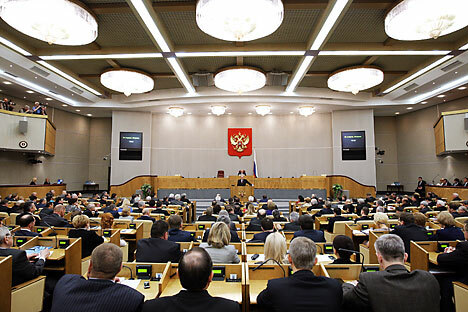 Formally, seven parties will be vying for seats in the Duma in the December elections, four of which are currently represented in parliament: United Russia, LDPR, KPRF and Just Russia. Polls show that three parties will enter the State Duma with no difficulty: United Russia, LDPR and KPRF. Just Russia, which was created before the previous elections as a kind of center-left loyal opposition party, has seen its popularity drop with the dismissal of its leader, Sergei Mironov, from his post as speaker of the Federation Council. A similar situation occurred with the Right Cause party, which surged in popularity this summer after billionaire Mikhail Prokhorov, in agreement with the Kremlin, took the reins of the party. However, Prokhorov proved less obedient than anticipated and soon resigned. Neither of these parties is expected to pass the seven percent threshold. A veteran of Russian politics is the liberal party Yabloko, which has managed to survive despite a lack of financial support. But as it has little money with which to advertise its message, ot is also unlikely to make it into the next Duma. Surveys from the independent polling agency Levada Center show that Russian society is almost evenly split between those in favor of maintaining the status quo and those who are ready for change. This split is dominating the election campaign, since the main question being decided in the elections is not which party will win, but rather if United Russia can preserve its absolute dominance and, consequently, continue the country’s current political and economic direction. Although this has been the question in elections for several years now, this time around, the stakes are higher. The term of service for deputies in the State Duma has been increased to five years, while – starting with the candidate elected in March 2012 – the president will serve for six years rather than four. In other words, Vladimir Putin and his team could stay in power for another 12 years.